Literally, “Dead Waters” this fortified town on the edge of the marshes of the salt marshes of the Camargue was the highlight of today’s Provence experience for our eight guests from Florida. A short one hour journey from our home base in Les-Baux-de-Provence, Aigues-Mortes stands like a stone sentinal on the edge of what used to be a busy harbor. Today, a parking lot and road fill the space once occupied by ships bound for the Holy Land on one of the many crusades of the 13th and 14th centuries. 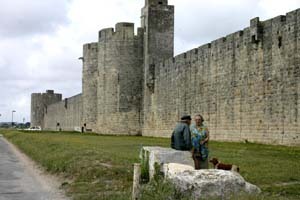 King Louis IX had the walls built in the middle of the 1200s around a town that was growing up around the salt trade. He had to bribe, cajole or threaten stonemasons to come to this desolate, mosquito-plagued place. Nowadays, thousands of tourists don’t need any convincing to spend a day here. The town is full of interesting little boutiques and some great restaurants.